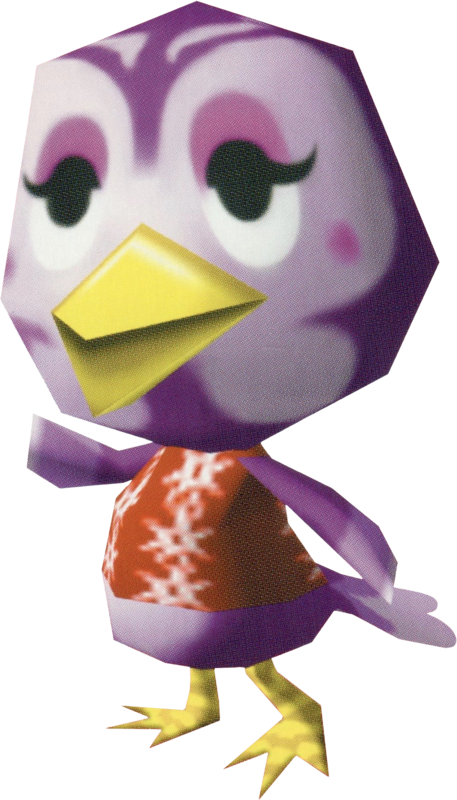 Madam Rosa is a snooty bird from the Animal Crossing series. Her only appearance was in Doubutsu no Mori e+, where she was an islander. Madam Rosa is a purple bird with a yellow beak. She initially wears a red aloha shirt. She wears purple eyeshadow and has purple cheeks. Madam Rosa is a snooty islander, so she will be rude to the player. Madam Rosa will enjoy gossiping and make-up and shopping. She will befriend the player the better they get to know her, but she will still act snobbish. Originally, Madam Rosa's house will lack any furniture, similar to all other islander houses. She will request from the player the same items that Ankha would request, except for different wallpaper and flooring. The e-Reader card for K.K. Marathon, which features Madam Rosa. Modified on April 5, 2019, at 11:39.